Before anyone dismisses The Pyramid because it’s yet another found footage horror film, hear me out. It’s the feature directorial debut for Grégory Levasseur, the guy who wrote High Tension and the remakes of The Hills Have Eyes and Maniac, it’s produced by Alexandre Aja and it stars Denis O’Hare, Ashley Hinshaw and James Buckley. See? How can you have a team like that and not have some serious potential? To further prove the point, the very first trailer for the film just hit and it’s far stronger than you might expect. Hit the jump to check out The Pyramid trailer for yourself. The film is due in theaters on December 5th. The newspaper clippings and Texas Chainsaw knockoff narration aren’t a particularly engaging way to start this promo off, probably because it feels a bit hokey and the imagery is too busy to pinpoint and consider the more disturbing elements of the visuals, but once we get to the present day stuff, things really pick up. One thing The Pyramid has going for it is that even though it’s shot found footage style, these archaeologists and reporters have some legit gear with them, so we’re getting high quality shots, not nauseatingly shaky and super gritty stuff. On top of that, the location is wildly cinematic and based on what we get in this trailer, Levasseur knows how to make the most of it. 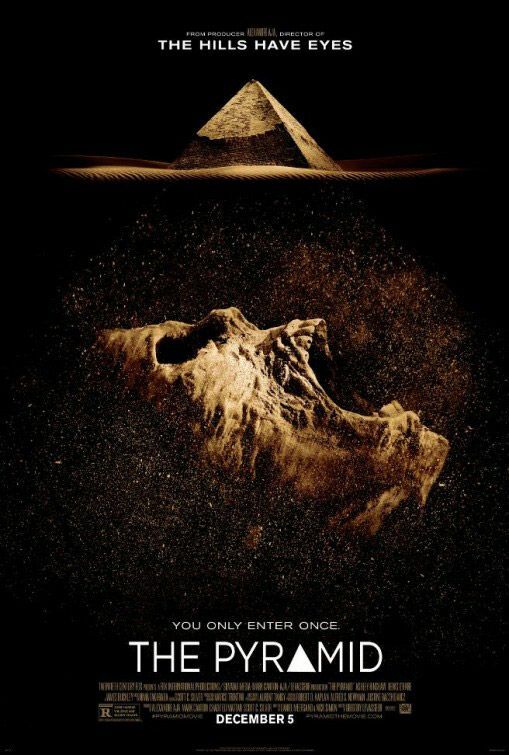 The pyramid setting also seems as though it’ll serve the more horrific elements of the film very well, too. When’s the last time we’ve seen a horror movie set somewhere like this? We could end up with some brutal beatings á la The Hills Have Eyes courtesy of that creature, but the mechanics of the pyramid could and likely will lend themselves to some innovative death sequences as well. At this point, this one’s definitely got my attention. The ancient wonders of the world have long cursed explorers who’ve dared to uncover their secrets. But a team of U.S. archaeologists gets more than they bargained for when they discover a lost pyramid unlike any other in the Egyptian desert. As they unlock the horrific secrets buried within, they realize they aren’t just trapped; they are being hunted.